Be the first to share your favorite memory, photo or story of Wyman . This memorial page is dedicated for family, friends and future generations to celebrate the life of their loved one. 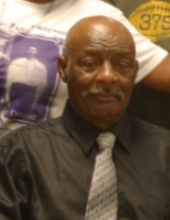 Wyman ( Bo ) Gregory, 77 (born October 23, 1941) of Lufkin, TX passed away on Sunday March 31, 2019 in Lufkin, Texas. His visitation will be Friday April 5, 2019 at All Families Mortuary 222 Leach Street Lufkin, TX from 5pm to 7 pm. His funeral service is set for 1:00 pm Saturday April 6, 2019 at Goodwill Missionary Baptist Church 812 E. Lufkin Ave Lufkin, TX. Funeral service Saturday April 6, 2019 1 pm at Goodwill Missionary Baptist Church. 812 E. Lufkin Ave Lufkin, TX. "Email Address" would like to share the life celebration of Wyman " Bo " Gregory. Click on the "link" to go to share a favorite memory or leave a condolence message for the family.